HDProGuide.com and HD Pro Guide Magazine announce the new 2018 Summer Shorts contest at the 2018 NAB Show in Las Vegas. The call for entries is open to all filmmakers, videographers, animators, and content creators. There are three categories for both Professionals and Students: Professional, College, and Jr. High/Highschool. Multiple submissions welcome. 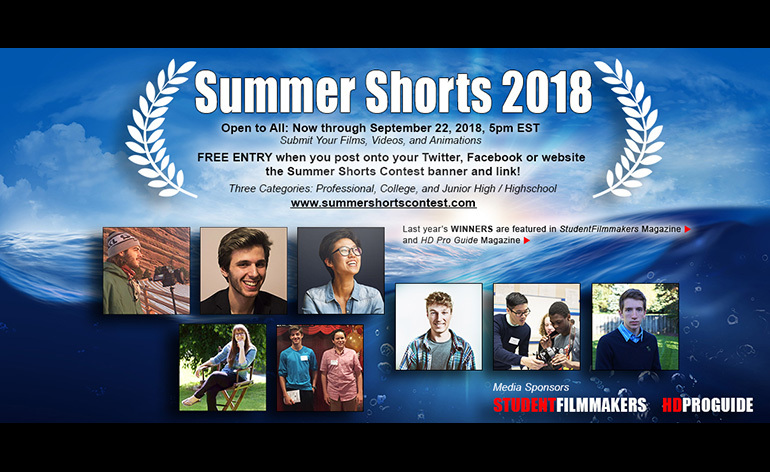 Free entry when you post about the Summer Shorts Contest and link, www.summershortscontest.com, on your social media Twitter, Facebook, Instagram, and/or on your personal website. Stop by the HD Pro Guide Exhibit Booth this week at #C8943 in Central Hall. Pick up the newest magazine editions and collectors editions at the booth. Meet and network with Publisher/Editor Kim Edward Welch during the show. Qualified readers can also sign up for complimentary subscriptions of HD Pro Guide Magazine and StudentFilmmakers Magazine at booth #C8943.